As scholars and teachers, we wished for a book that would expose students to the study of political communication and to the depth and diversity of research in this field. When we discussed our ideas with colleagues teaching similar courses, we found that they too wanted their students to read a more comprehensive selection of the important literature of the field, in addition to traditional, groundbreaking works. A recurring theme throughout these conversations was that we needed a collection that would discuss campaign communication, address the growing body of political communication theory, identify important explorations of the legislative and judicial branches of the federal government, and discuss the political discourse of groups that are often marginalized in the political world. Readings on Political Communication is our attempt to respond to these needs. This book identifies major areas of interest for teachers and scholars of political discourse. It also demonstrates the depth and breadth of scholarship and provocative research in the study of political communication. The book is designed for students, scholars and researchers who wish to know more about campaign communication, to learn about major trends in this field, and to understand other forms of political communication in governing bodies and people's movements. There are so many good researchers and excellent work in our field, selecting only thirty-five essays was a difficult challenge. In general, our selections were guided by our desire to include essential concepts and scholarship that would also be accessible to students, while still allowing us the flexibility to assign additional books or essays. 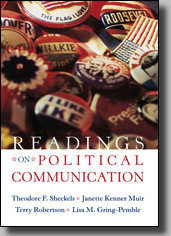 Within each chapter, we selected essays that would provide someone new to political communication with a sound understanding of what the study of political communication is and does, and that we thought would best advance students' broad understanding of political communication. Our goal was to reflect the multiple concerns and the multiple research methodologies of the field. To introduce students to the study of political communication, we needed a mix of essays that would present important observations and challenge conventional thinking. We wanted essays that have advanced the study of political communication by refining and revising its research norms, as well as essays that would reflect important historical developments in the scholarship. We also wanted the readings to run the chronological gamut, from groundbreaking pieces of earlier decades to some of the most incisive work of recent years. Throughout, the book reflects the concerns of the rhetorical critics, media studies scholars, and social scientists who study political communication. It is intended for a variety of political communication courses-from the traditional to the not-so-traditional, from the rhetorical to the social scientific, from courses within the speech communication tradition to those more attentive to how mediated communication affects politics. The introduction to Readings on Political Communication traces the evolution of political communication as an area of scholarly and classroom study. It highlights several themes that characterize work in that area and that are woven throughout the rest of the book. Each subsequent chapter begins with an introduction that briefly previews the selections and contextualizes them within the field of political communication and within politics. Chapter 1, "Political Communication Frameworks," provides an overview of several prevailing frameworks for understanding political communication and presents students with a picture of a dynamic field of inquiry. The first and the last essays assess the field and suggest how the study of political communication has evolved over several decades. Other essays in this chapter point to changes in perspective that have caused students of political communication to ask new questions. Chapter 2, "Election Campaigns," is the first of three chapters on election communication. Essays in this chapter discuss the dynamics of campaign communication and explore the phases of a campaign. They also point to changes in campaign communication over the years, particularly those wrought by the media. Chapter 3, "Election Campaign Advertising," deals more specifically with the televised advertising that has become an important facet of contemporary elections. The essays in this chapter analyze mass media advertising, explore its effects, and deal extensively with the attack ads that have evoked concern about effects on the electorate. These essays also reflect the nature of political advertising research that was particularly robust in the early 1990s. Chapter 4, "Election Campaign Debates," turns to televised debates-in particular, those debates between or among those who aspire to the presidency. These debates have been criticized by some communication scholars and defended by others. The essays in this chapter reflect the criticism but move beyond it, to an understanding of what the debates do and do not accomplish in a campaign. In addition, the essays offer valuable insights into how media have played a role in what the debates-for good or ill-communicate through the questions that journalists choose to ask, the camera shots that directors choose to use, and the stories that reporters choose to write. Chapter 5, "The Presidency," moves beyond elections to presidential governance. The essays in this chapter reflect the growing attention to the "rhetorical presidency" that has arisen with increased media coverage. The essays also reflect a change in scholarship, from studying the speech to studying presidential public address in larger contexts and with a greater awareness of the president's physical presence and cadre of speechwriters. Chapter 6, "The Legislature and the Judiciary," consider essays that range from congressional debates-historical and more recent-to proceedings conducted by committees. The concluding essay examines legal practice rhetorically, with a landmark Supreme Court decision as its illuminating example. Chapter 7, "Voices from the Margins," focuses on the rhetorical strategies that native North Americans, African Americans, women, and other marginalized groups use to engage in political communication. These voices from the margins often result in important political changes. While previous chapters focus on government, these last essays take students from the hallowed halls of Washington, D.C., to sites they may not immediately associate with politics. We know there is no single design for political communication courses. Thus, the book is designed to be used in whatever way fits a particular course. An instructor might well proceed chapter by chapter through this anthology. In each chapter, the articles are arranged chronologically, and it might be profitable to have students read them in that order to suggest how research in that area has progressed. Other orders are possible, however, depending on the issues that an instructor wishes to emphasize or the structure of the course. We hope that the book reflects a logic, but also permits a good bit of flexibility. Finally, "Looking to the Future: Additional Readings," provides an annotated list of supplementary articles and book chapters that have contributed significantly to the research community's collective understanding of political communication. We felt that a short, focused list might encourage individual students to locate and read selections of interest to them. These essays may also guide students in further explorations of topics related to their research interests. The word "community" was used intentionally in the preceding section. We think it is appropriate to close this preface by talking about the political communication community of scholars and teachers who are passionate-as we are-about political matters and diligent in their application of varied methodologies to the study of those matters. We see ourselves, through this book, providing a service to this community of which we are active members. In our view, political communication was not only ready for a collection of readings such as this one; it needed such a text to introduce students to the breadth of an exciting field. Our goal has been to serve the community by bringing together in a single volume the theory and research that would introduce what we do, as scholars of political communication, to others who might, in turn, embrace the field and join our community. Throughout the process of compiling this anthology, we were helped by two groups of colleagues. The first group responded to a questionnaire we circulated, asking respondents to rate eighty-eight possible selections as well as point out omissions. These valued colleagues were William L. Benoit, University of Missouri; Celeste Condit, University of Georgia; J. Michael Hogan, The Pennsylvania State University; Kim Kahn, Arizona State University; Kathleen Kendall, University of Maryland; Mitchell S. McKinney, University of Missouri; Richard M. Perloff, Cleveland State University; Michael W. Pfau, University of Oklahoma; Mary E. Stuckey, Georgia State University; and Judith S. Trent, University of Cincinnati. We thank them for their help. The second group evaluated the proposed book at several stages at the request of our editor. These reviewers offered numerous suggestions about not only the selected readings but many other aspects of the anthology. They were Diana B. Carlin, University of Kansas; Alan Chartock, University of Albany-State University of New York; Jean L. DeHart, Appalachian State University; David Henry, University of Nevada, Las Vegas; Allan Louden, Wake Forest University; Shawn J. Parry-Giles, University of Maryland; Trevor Parry-Giles, University of Maryland; Sandra J. Sarkela, University of Memphis; J. Cherie Strachan, University of Albany, State University of New York; Patricia Sullivan, State University of New York, New Paltz; and Robert E. Terrill, Indiana University. We also thank them for their valuable advice. As is typical in publishing a manuscript of this volume, many life changes occur along the way. In the process of putting this together there have been job changes, new babies, home renovations, and family crises. We are grateful to our families and colleagues who have supported us along the way, and who have watched with great patience as we have gone through numerous drafts, final edits, and word counts. Finally, we would like to acknowledge the guidance, assistance, and sometimes insistence of our editor Kathleen Domenig. As editor and publisher, Kathleen, from the outset of this project, wanted this anthology to be of the highest quality. We, at times, tended to look at the book from our disciplinary perspective. She kept nudging us back to the prospective instructor's and the prospective student's perspective, encouraging us to balance these two slightly different perspectives. For Kathleen's commitment to us and this project, her limitless patience, thoughtful suggestions, and meticulous attention to detail, we are most grateful. We hope you will find this book to be useful and essential in representing this rich body of knowledge that we know as political communication. May these essays inform and inspire you. Copyright © 2007 by Theodore F. Sheckels, Janette Kenner Muir, Terry Robertson, and Lisa M. Gring-Pemble.